The Vassar women’s basketball team rebounded from a tough loss on Friday night to take an 80-75 decision over William Smith on Saturday afternoon. 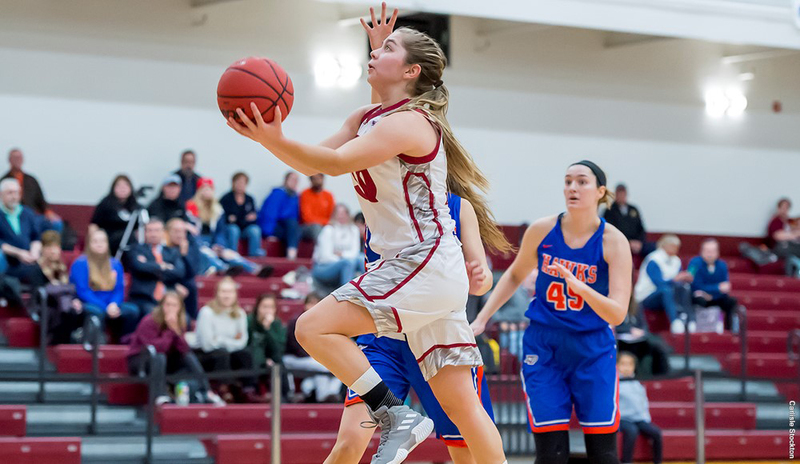 GENEVA – The Vassar women’s basketball team rebounded from a tough loss on Friday night to take an 80-75 decision over William Smith on Saturday afternoon. Four Brewers scored in double-digit figures, with Vassar holding the Herons to a 36.6 shooting percentage. With the win, Vassar moves to 4-2 overall and 1-1 in Liberty League play, while William Smith slips to 2-3 and 0-2 in the conference. Vassar jumped out to a 5-0 lead in the first after a Jackie Cenan layup and three-pointer in the opening minutes. William Smith responded soon after, going on a 12-4 run before Maddie Leong cut the Herons’ lead to eight after a jump shot at the 2:15 mark. Isa Peczuh beat the clock in the final seconds to cut the lead to 22-16 heading into the second. The Brewers defense locked down in the second, holding William Smith to seven points. Peczuh opened with her first triple at 9:26 to cut the lead to 22-19, but the Herons followed with a pair of free throws. After two more Heron free throws, Vassar went on an 18-3 run to close the half. William Smith’s Stavriana Dimitrakopoulou knocked a trey at 4:03 to go up 29-25 and that was the last shot Vassar allowed. Peczuh made another three to tie the game at 29-29, and 20 seconds later connected for another to give Vassar its first lead since the first. Cenan knocked down a jumper at 1:05, and then found Peczuh for a buzz-beater three to put the Brewers up 37-29. William Smith answered in the third after a Juliana Gamboa triple made it a five-point game. Sophie Nick then picked up an inside layup, and Peczuh launched another tree to make it 42-34. A few Herons’ runs kept the game close, cutting the Brewers lead to 52-50, but Sarah Gillooly tacked on two free throws to close quarter 54-50. Playing from behind, William pushed the tempo in the final stanza and opened on a 13-4 run while taking the 63-60 lead at 6:46. Coming out of a Vassar timeout, Peczuh hit a three to retie the game, but William Smith then scored five unanswered to go up 68-63 with 5:18 remaining. Ryan DeOrio scored the Brewers next five points, but the Herons hung on to their lead. A few back-and-forth baskets and lead changes kept the game close, but a DeOrio layup at 2:03 tied the game 74-74. The Brewers settled in, allowing only one free throw for the rest of the game. Cenan gave Vassar the lead at 1:04, and then an intentional foul on DeOrio wrapped things up for the Vassar win. Peczuh led all scorers with 24 points and shot 6-for-11 from behind the arc. Cenan chipped in 21 points, while Nick and DeOrio added 14 and 13, respectively. Nick also had 11 rebounds with five assists. Maddie Leong tallied five assists as well. The Brewers return home on Thursday night for non-conference action against Williams at 7 p.m.